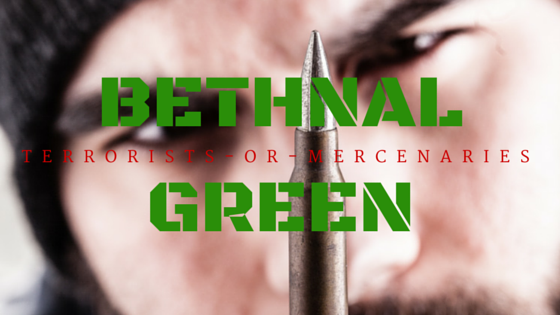 The Bethnal Green Mercenaries – Sorry! Terrorists. As an ex-military man, I am intrigued by the TV reporting of the people leaving to fight or live in a war torn region. When I was serving in the Royal Air Force I got into a bar-brawl with a civilian who had just returned from fighting in Africa where he had served as a mercenary…not that I knew that beforehand, otherwise I might have backed away from the altercation. I lost the top of my ear in that tussle to a man who was a very disturbed and aggressive man. And this is how we perceive mercenaries to be, in general. However, today it seems mercenaries are something akin to our modern-day football hooligans. Hooligans are not necessarily unemployed, dole scrounging thugs but are often well-off, middle-class boyos. This often appears to be a surprise to the authorities and broadcast journalists. Surely not our solicitors, dentists and white collar workers taking great delight in sticking the boot into their fellow man. Just like the shock of hearing about well educated university graduates becoming radicalised and hopping off to Syria to stick the boot in to, or for, Isis. This led me to become inquisitive about the kind of person who might go to foreign lands to fight for a cause that has no motive other than getting away from what they have and dont like, and for some the lure of earning big money. I found out that there are a lot of people who want mercenary on their CV! Well-educated upstanding citizens, not just thugs, are all willing to sign up for the adventure. Just look here and read the comments section which is quite eye-opening: Becoming a Mercenary, and I quote: “I really want to be a mercenary. I can be a mercenary. War is in my blood, soldier is my life”! The question therefore is: Are those that are radicalised actually terrorists or do they just become ‘mercenaries’ at some point in time. In the main mercenaries are generally ex-military personnel who are combat-trained…they are certainly not schoolgirls from Bethnal Green. However according to the press, all these youngsters heading off to Syria are not mercenaries they are simply deemed to be terrorists. That makes for an interesting twist and a better headline of course. Yes, the TV news is all a flutter regarding people going off to fight, with broadcast journalists claiming that they are, “off to commit terrorist acts”. The word mercenary does not get used because it is assumed that they are going because of fanaticism and because of a paid contract. Yet how do we know? We haven’t talked to them about it. Got a copy of the contract by any chance? The Geneva Convention Art 47. Mercenaries states a mercenary is any person who is especially recruited locally or abroad in order to fight in an armed conflict and does, in fact, take a direct part in the hostilities: is motivated for the desire for private gain – However it is rather ambiguous about what that gain is as it does not state money but rather mentions material compensation that is substantially more than is paid to the armed forces of a party. I don’t see soldiers in the war-torn regions of Mali, Syria, Afghanistan etc. stopping off at the bank to drop in their pay-cheque or setting up direct debits for their mortgages. What are they being paid? Board and lodge in the main I would imagine and a whole load of weaponry with a Toyota truck thrown in. So can the Bethnal Green girls be considered mere mercenaries? Perhaps that is all they are. For me personally, having been in the military I understand the adventure, the adrenalin of armed excursion and all that this action filled adventure might seem to be. I fully understand why someone might want to go away and fight because I have seen it at first hand when the Ascension Island conflict flared up. I saw soldiers queuing to sign up to go to Kuwait during the Gulf war. Many civilians appear to want to have something to do. Something that is not mundane and poorly remunerated in their boring countries. Some people have radical beliefs and some want nothing more than to help other persecuted people as we have just read in the Guardian: Brits abroad: is it against the law to fight Isis? How many people around the world have fought in wars out of passion, or as a paid mercenary and returned to their normal life? Will we go after them like we are going after the present Syria hopping batch? Might it actually be somewhat like the ex-mafia boss Domenico Rancadore now 64 years old found living a ‘blameless life’ in Uxbridge (of all places) while running a travel agency in London. He was outed this week and arrested. What a story he could tell us over a cappuccino in Costa cafe. No, not about setting up holidays to Palermo 😉 or Naples, but all the nasty stuff he is purported to have done when he was active in the Mafia. Does he miss it? Why did he stop? Was he ‘radicalised’ at a young age or did he just loved the thrill of it all? Interesting parallel or nonsense? Television and social media with 24-7-365 story-filling needs means that journalists have a 24-7-365 search for sensationalist stories so we see the twisted tales, embellished opinions and often assumed facts that all add to the scaremongering in todays paranoid society. Are all these people, who are leaving to fight and to possibly die in a conflict, really a threat to us at home or should we be more concerned about those that choose to stay at home in France, Holland, UK, Germany etc. Who are we actually helping by stopping the voyage of a few hundred people possibly thousands? Us, them, who? Shouldn’t we be sending in the armed forces to quell the uprisings in the regions or is that also too old-fashioned war mongering? If we don’t send in the forces, forces WILL be created from volunteers. We will not calm the world’s war mongering masses by stopping girls from Bethnal Green; nor will we gain anything from calling them terrorists, especially if they have simply gone to marry and make a home however silly that might seem (if that is possible in such a place). There are no answers to any of these issues however I do feel that we are none the wiser than we were when they left. The silly journalism that is 24-7-365 regurgitated, repetitive, reiteration on TV News channels will only give you a biased viewpoint. So in my research I found this article below, which is well balanced and worth reading if you want to have a view on foreign fighters and the potential fear evoked by the thought of their return.